Jonathan Zehr, professor of ocean sciences, leads the marine microbiology research program. Photo by T. Stephens. The Gordon and Betty Moore Foundation has awarded a $4.8 million grant to the University of California, Santa Cruz, to fund ongoing research in marine microbiology. The five-year grant supports a UCSC research program called MEGAMER (Microbial Environmental Genomics Applications: Modeling, Experimentation, and Remote sensing), established in July 2005 with a $2.2 million award from the Moore Foundation. 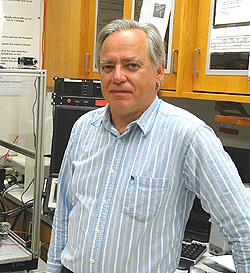 Jonathan Zehr, professor of ocean sciences and principal investigator on the new grant, oversaw the establishment of MEGAMER. Research in the MEGAMER labs focuses on studying and monitoring microorganisms in the ocean, particularly in the waters of Monterey Bay. The oceans swarm with tiny organisms invisible to the naked eye, but so abundant and diverse that they affect the global environment in surprising ways. By controlling the biological, geological, chemical and physical processes that influence the natural environment, marine microbes affect the global climate and help maintain ocean fertility, Zehr said. "When people think about microorganisms, they usually think about pathogens and disease-causing bacteria," he said. "And when they think about ocean health, whales and seals come to mind first. But it's the natural microorganisms that don't cause disease that are the most important in the oceans." Zehr and his colleagues are primarily interested in understanding how the diversity of marine microorganisms affects the global environment. These microbes play a key role in ocean processes and will help determine how global climate change affects the oceans in the future. The researchers are also studying how ocean dynamics control the structure and function of microbial communities, which are poorly understood due to the difficulty of monitoring microbes in the oceans. New "remote instrumentation" technologies will allow the researchers to sample the oceans from fixed, autonomous ocean observatories. Biological sensors, or probes, are a key component of this technology, which Zehr has been working on with Christopher Scholin, a molecular biologist at the Monterey Bay Aquarium Research Institute (MBARI). Scholin developed the Environmental Sample Processor (ESP), an instrument capable of detecting genes in the ocean and radioing information back to shore without human assistance. Initially developed to detect harmful algal blooms, the ESP "essentially put in place the instrumentation allowing us to do molecular biology at sea," Zehr said. He and Scholin have designed sensors for the ESP that will detect and monitor microbes involved in important ocean processes. One such process is nitrogen fixation, whereby certain marine microorganisms convert nitrogen gas into a form that can be used by other organisms, thus helping to "fertilize" the oceans. Zehr has made key discoveries in this area. Some of the probes being developed by Zehr and Scholin will use a new module that amplifies detected microbial genes on the spot through a process called the polymerase chain reaction (PCR). PCR is a powerful technique widely used in molecular biology laboratories, and the upgraded version of the ESP will be able to do it autonomously. "It can hang in the ocean and do real-time PCR at sea," Zehr said. "This is just the tip of technological development. If we can do this, there's really nothing stopping us from making instruments to detect any of the many organisms that are key in controlling the habitability of this planet." But it's not just a matter of designing and implementing these molecular biology probes. Mathematical modeling of microbial population dynamics is also necessary, and the grant will fund several UCSC ocean scientists working on this arm of marine microbiology research. "Oceans are big and very dynamic, so if you're going to sample something, you need to know when and where to sample it in order to obtain useful information," Zehr said. For example, a map of surface chlorophyll content in Monterey Bay is never static. Water comes up from the deep ocean, or washes in from offshore, and these movements are constantly changing. "If you take a sample at one point in time in Monterey Bay, an hour later it may be very different there because the waters in that position will change," Zehr explained. "So if you have a way to model how water moves and how the temperature changes, then you can predict how a microorganism and its activity will be distributed." Christopher Edwards, assistant professor of ocean sciences, is one of the MEGAMER collaborators involved in designing mathematical models that account for how ocean productivity varies with factors such as light availability, temperature, and nutrients. "People are much more familiar with weather forecast models, but what we do is really very similar," Edwards observed. "Instead of representing atmospheric winds and precipitation, our models represent ocean currents and the underlying changes to the ecosystem as plankton grow, are consumed or die, and decay." Edwards works closely with Raphael Kudela, associate professor of ocean sciences, and Andrew Moore, professor of ocean sciences, both of whom will also receive funding from the new grant. Together, they have developed several models of nitrogen-fixing microbes and other microorganisms in the oceans. The researchers have also applied these ideas to a new model that simulates the complexity of ocean biological communities. "Though the ocean looks pretty uniform from the surface, there are enormous differences underneath," said Edwards. "In nature, different sets of organisms thrive in different regions. By representing this biological diversity in our model, we hope to understand better how marine microbes influence ocean productivity." MEGAMER will also continue to be an important contributor to ongoing research at the Center for Microbial Oceanography Research and Education (C-MORE), Zehr said. C-MORE, established by the National Science Foundation and based at the University of Hawaii at Manoa, is an interdisciplinary science and technology center with six partner institutions, including UCSC. "We're helping to develop remote instrumentation for studying microbial processes at C-MORE," Zehr said. "Obviously, microorganisms in the Central Pacific are very different from the ones here in Monterey Bay, which means coming up with different tools for different processes." Zehr and colleagues are hoping to get the new probes they have developed into the ocean as soon as possible, before moving on to produce many more of these molecular biology sensors. "Now that we've figured out how to put a probe in place, we can work with collaborators around the country-even around the world-who are experts in different types of probes. We can help develop their probes to be placed on an instrument like the ESP," he said. Current probes are focused on a few types of marine microorganisms, but the long-term vision, Zehr said, is to develop sensors with the ability to detect many different types of microorganisms simultaneously. "It's the normal microflora of the oceans that are really important in ocean control," he said. "You could take the whales and the seals out, and the oceans would still be controlling the planet's biogeochemistry." Note to reporters: You may contact Jonathan Zehr at (831) 459-4009 or zehrj@ucsc.edu.